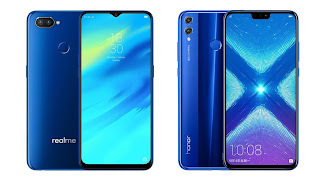 Realme 2 Pro has a Polycarbonate body which looks like Glass whereas Honor 8X has Glass body. Realme 2 Pro has a Dewdrop 6.3-inch (2340 x 1080 pixels) Full HD+ 19.5:9 aspect ratio TFT display whereas Honor 8X has 6.5-inch (2340 × 1080 pixels) Full HD+ 19:5:9 2.5D curved glass display. Realme 2 Pro is powered by 2.0GHz Octa Core Snapdragon 660 14nm Processor with Adreno 512 GPU compared to Octa-Core Kirin 710 12nm processor on Honor 8X. Realme 2 Pro has a 4/6/8GB RAM and 64GB/128GB internal Storage whereas Honor 8X comes with 4/6GB RAM and 64/128GB internal storage. 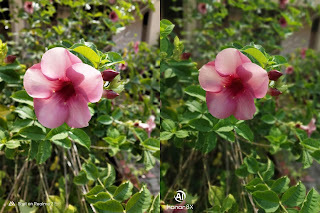 On Camera Realme 2 Pro has a 16MP rear camera with LED flash, f/1.7 aperture, secondary 2MP camera and 16MP front-facing camera compared to Honor 8X which has a 20MP rear camera with LED flash, f/1.8 aperture, 2MP secondary camera and 16MP front-facing camera with f/2.0 aperture both cameras can record 4K Videos and has support for AI portrait mode. Both phones have support for Face Unlock, Fingerprint Scanner, Dual 4G VoLTE, dedicated MicroSD card Realme 2 Pro is packed with a 3500mAh battery compared to 3750mAh Battery on Honor 8X. both phones do not support fast charging and come with Micro USB Port. Honor 8X comes in Black and Blue colors priced at Rs. 14999 for 4GB RAM with 64GB storage, 6GB RAM with 64GB storage Rs. 16999 and 6GB RAM with 128GB storage costs Rs. 18999 available exclusively on Amazon.in starting from October 24th. Realme 2 Pro comes in Ice Lake, Black Sea, and Blue Ocean color variant priced at Rs 13,990 for 4GB RAM and Rs 15,990 for 6GB and Rs 17,990 for 8GB RAM.